Another Band-Aid budget deal won’t fix the financial problems that plague Illinois or stop the state’s credit rating from falling to junk. Now Illinois is in the midst of its worst fiscal crisis ever, and yet another bad deal is on the horizon. The Illinois Senate’s proposed “grand bargain” would hit Illinoisans with billions in higher taxes because it has no real reforms to address out-of-control spending drivers. Though politicians are facing pressure to pass any budget plan to avoid yet another credit downgrade, Illinoisans can’t afford another bad deal – and the state can’t afford to try another Band-Aid fix in hopes of staving off the day of reckoning. Bad deals are what got Illinois into its current mess. Instead, the state needs a plan that actually solves Illinois’ structural problems. The state’s past is littered with politicians’ “deals.” Those fixes only papered over the state’s problems, leaving them to fester and develop into worse crises a few years later. That’s been the case for issues such as pensions, workers’ compensation, property taxes and balanced budgets. Former Gov. Jim Edgar’s 1996 pension ramp was a disaster for taxpayers. Former Gov. Rod Blagojevich’s $10 billion pension bonds let him avoid tackling reforms and left Illinois higher in debt. And former Gov. Pat Quinn’s $32 billion temporary tax hike allowed politicians to increase spending, leaving Illinois on a budgetary cliff when the tax hike expired. Every one of those deals had something in common – they all avoided fixing Illinois’ structural spending problems. The Senate’s proposed “grand bargain” is the most recent example. It’s been fueled by frantic calls to “do something” in the middle of the crisis. The two-year budget impasse isn’t the real problem in Illinois. The state’s budget gridlock is just the culmination of more than three decades of dysfunction, misplaced spending priorities and fake reforms. The current stalemate simply exposes the state’s deep structural problems, from the prioritization of state worker compensation and pensions over core services and other programs, to irresponsible borrowing and spending. Lawmakers cannot solve those problems by hitting Illinoisans with higher taxes. The truth is Illinois can no longer put off real spending reforms, and more tax hikes will only drive more residents to flee the state and punish those who can’t leave. Lawmakers have to pass a balanced budget that actually solves the state’s structural problems without tax hikes. 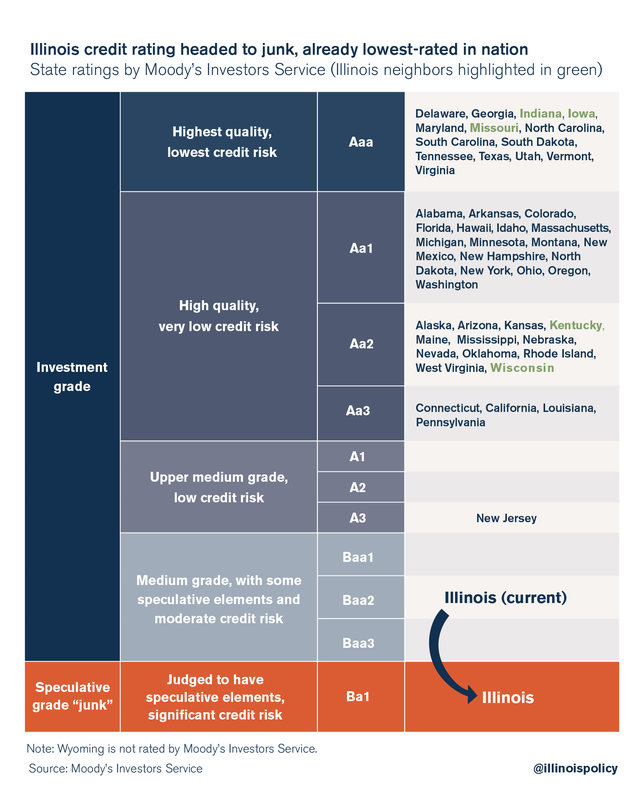 Without reforms, Illinois won’t be able to shake off an eventual junk bond rating or get off the path to bankruptcy. A credit downgrade to junk. Credit rating agencies have warned they’ll downgrade the state’s credit – possibly down to junk status. A downgrade will cause all kinds of pain for Illinoisans, the most immediate being the diversion of more of the budget from core services to pay for much higher borrowing costs.But the bigger cost will be, notwithstanding Illinois’ already low reputation. No state has ever been rated junk before. Small businesses, entrepreneurs and families will have to contend with either coming to or staying in a state with a governance structure not unlike those of failed states in emerging markets – corrupt processes, massive deficits, sky-high taxes and out-migration. Families and businesses have 49 other options from which to choose, and all are rated better than Illinois. Unpaid bills will skyrocket. 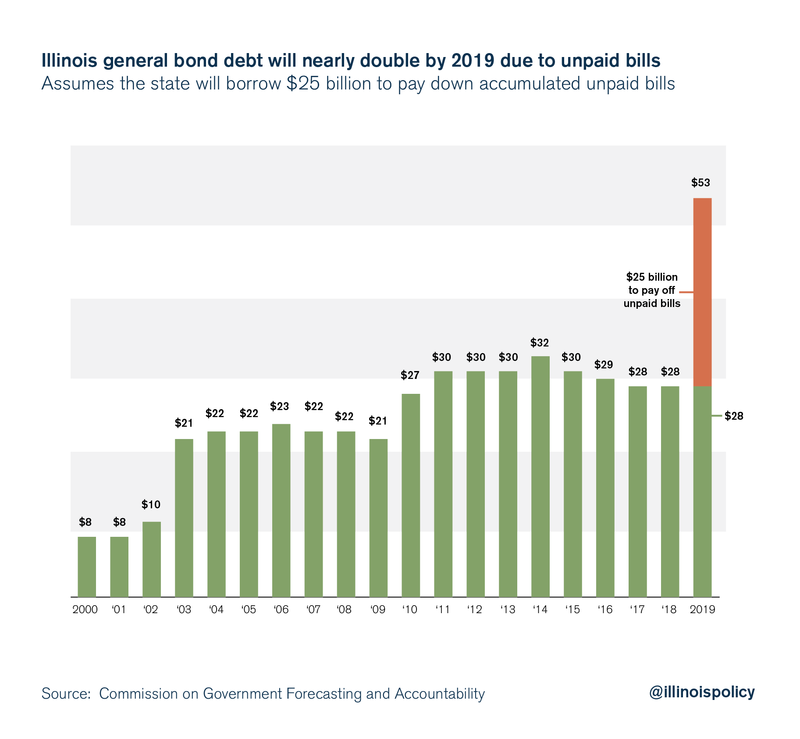 Illinois currently has nearly $12 billion in unpaid bills, which, under the current impasse, are expected to total nearly $25 billion by early 2019. Illinois’ borrowing costs will soar even higher. 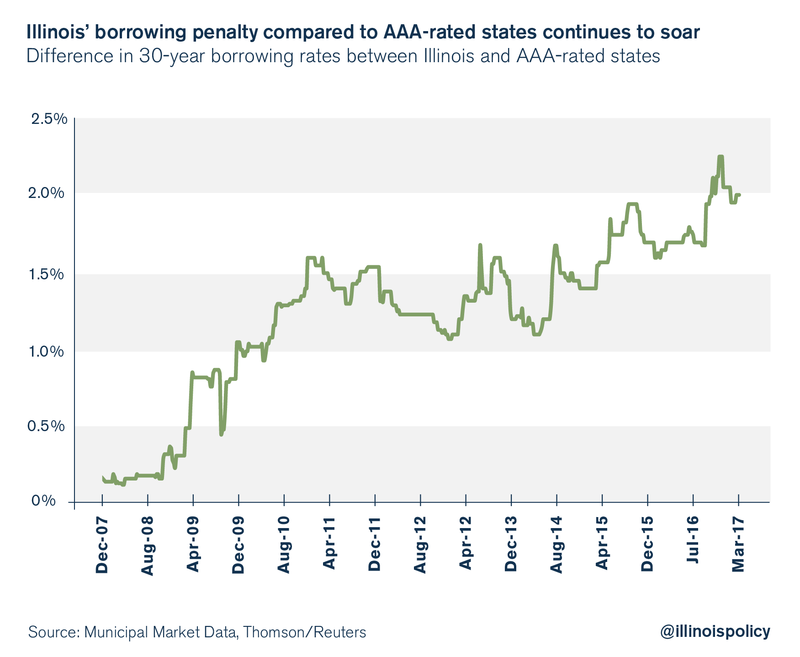 With dramatically more debt and a junk bond rating, Illinois’ borrowing rate would continue to rise compared with AAA-rated states. Neighboring Indiana, Iowa and Missouri are AAA-rated.Today, Illinois borrows money at a 5 percent rate, compared with just 3 percent for states with AAA ratings. That 2-percentage-point penalty already costs Illinois $20 million dollars extra each year for every billion dollars the state borrows – valuable resources that could go toward core government services.With more downgrades potentially on the way, expect that penalty rate to jump and Illinois to divert even more of its budget toward interest costs. More social programs and other services will be cut. 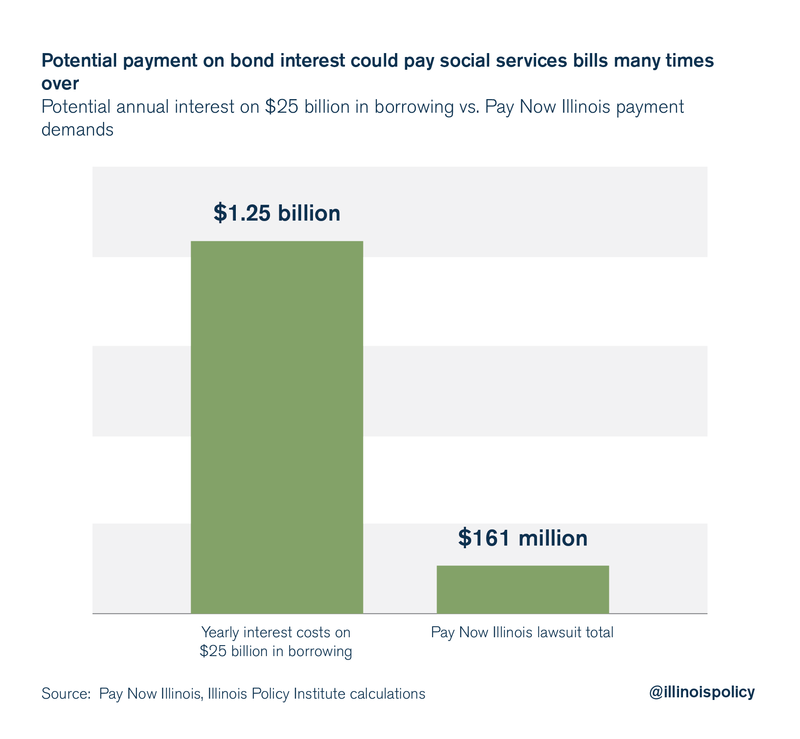 The interest costs alone on $25 billion in new borrowing to pay down the state’s unpaid bills will total $1.25 billion, assuming today’s borrowing rates.That money won’t go to help Illinois’ most vulnerable residents or shore up struggling social services. Instead, that massive amount will go to Wall Street.To understand how big that annual interest payment would be, consider the fact that the Pay Now Illinois coalition of approximately 100 different social and human service groups is suing the state for payment on $161 million of its unpaid bills.That $161 million is just a fraction compared with what Illinois would pay on just the interest on its borrowing by 2019. Pension costs will continue to grow out of control. Illinois owes $130 billion in state pension debt, up nearly $100 billion from a decade ago. Without real reforms, that crisis will continue to grow. 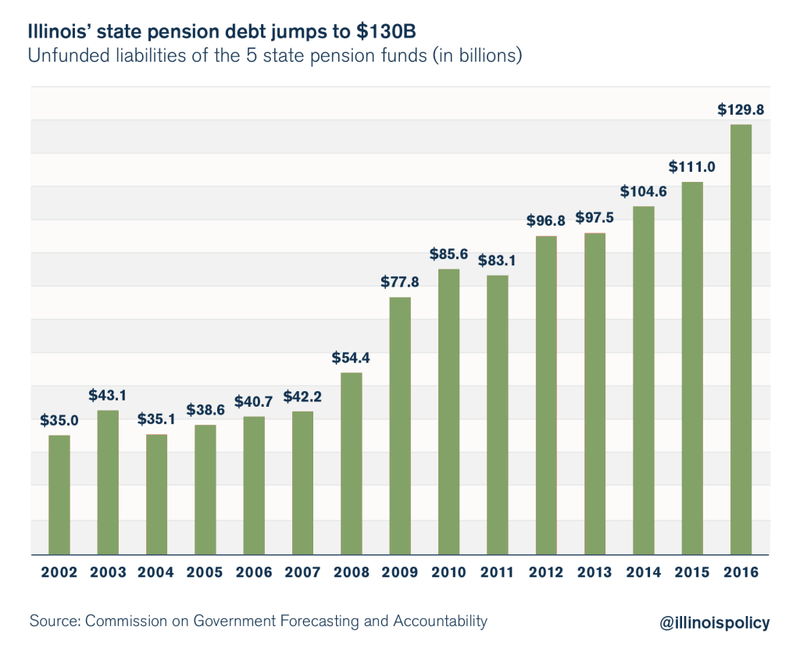 As Illinois’ pension debt rises, so will the cost necessary to keep pensions funded. Illinois already spends nearly $8 billion a year on pension costs – nearly 25 percent of its general fund budget.By 2019, Illinois will have to put another $1 billion annually into pensions instead of funding other core services. Illinois’ continuing crisis will build pressure for a bad “compromise” deal such as the Senate’s “grand bargain,” which proposes tax hikes as a Band-Aid substitute for necessary reforms. Illinoisans have already seen that a tax hike won’t solve the state’s problems. Illinois’ economy, its credit rating and its job market suffered during the 2011-2014 period when Illinois tapped taxpayers for nearly $32 billion during the state’s temporary income tax hike. New money flowing merely relieved Illinois lawmakers from pressure to enact needed reforms to unsustainable cost drivers. Politicians simply spent the funds. 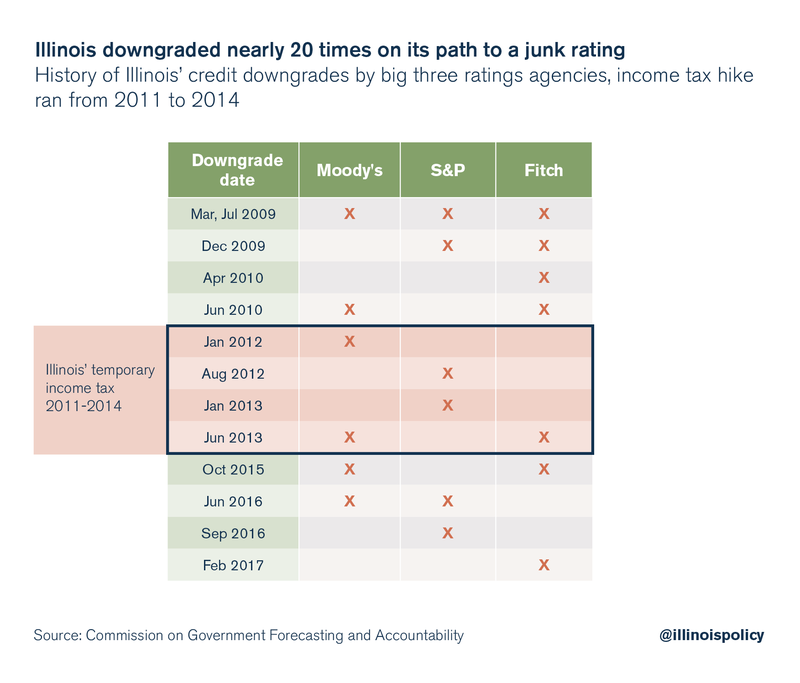 And Illinois suffered several credit downgrades during the hike. Illinoisans don’t need more painful, counterproductive tax hikes. They need real spending reforms that fix the state’s structural problems. Only a reform plan that balances the budget without tax hikes can do that. That’s why the Illinois Policy Institute has provided a reform road map for Illinois government. The plan provides tax relief to struggling homeowners through a comprehensive property tax reform package, implements reforms that begin an end to the pension crisis, and enacts major reforms to spending on health care and government worker compensation.